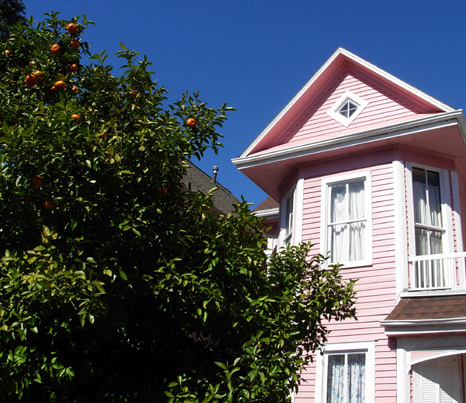 city's Victorian neighborhoods that have been restored to their former splendor . . . "
Galveston has been through many economic and social phases, some rather sordid and some quite refined. Fortunately, it's mostly refined and elegant again now. I mentioned in a previous entry some of the history of pirating and plunder of ships off shore, the smuggling of slaves and liquor into Texas, and various skirmishes to gain control of the island (Spanish, French, Mexicans, Texas Revolutionaries, etc.). I failed to mention gambling and prostitution in that entry because I was writing about the end of the island with the state park, not the city. It was mostly booze, gambling, and prostitution that earned Galveston proper its reputation in the early 1900s as the "Sin City of the Gulf." It wasn't always like that. After the Civil War, Galveston was the principal seaport in Texas. It grew to become the state's largest and wealthiest city by the end of the 19th century. This time period (1870s to 1900) was the "Gilded Age" in America, a time of gross materialism and the Industrial Revolution. It coincided with the prosperous Victorian era in England (1837 to 1901). 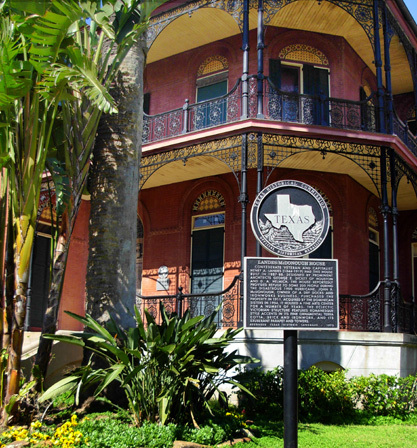 During the Gilded Age, Galveston was known for its hospitality and charm. 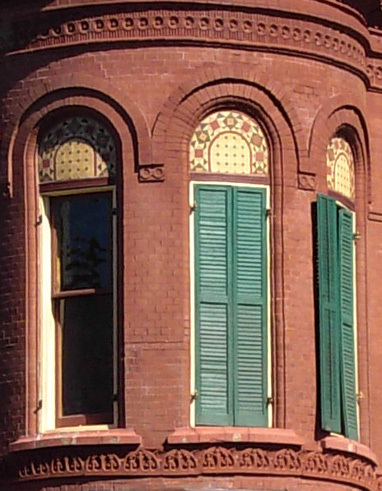 Many stately Greek Revival, Gothic, Italianate, Richardsonian Romanesque, Queen Anne, and even Moorish buildings were constructed from 1850 to 1900. Unfortunately, quite a few of them were destroyed in the devastating hurricane of 1900, when about 6,000 people were killed (see this entry for more details). Even as it rebuilt itself, Galveston seemed to return to its baser beginnings and soon lost its former status to nearby Houston. 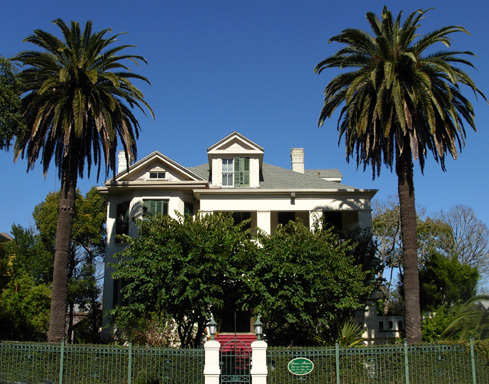 The island city somewhat languished as a desirable place to live or visit until the 1970s, when the Galveston Historical Foundation began restoring the old buildings and houses. That was a very wise move, because the effort produced major rewards within a few years. 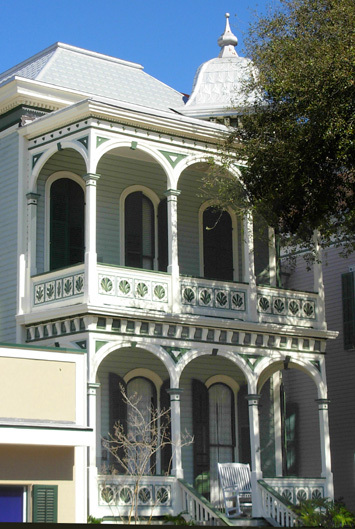 As more and more buildings were returned to their original elegance, Galveston turned its image around. Grace Manor B&B, 1702 Postoffice Street. Architect George Stowe. Completed in 1905. 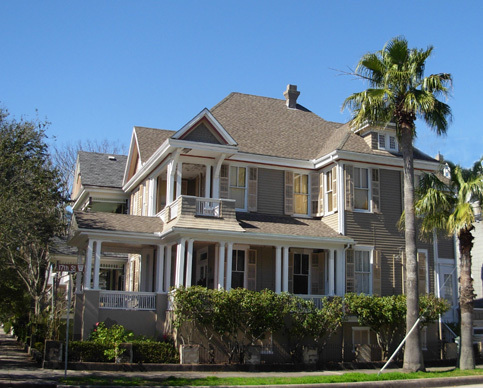 The resurgence of those neighborhoods and a lively downtown area, combined with the island's enticing natural assets, have helped Galveston become a very desirable place to live and play. It is a leading Gulf Coast resort area, boasting top hotels, restaurants, shopping, art galleries, antique shops, events, and entertainment. Tourism is probably as big an industry here now as shipping and oil. And one of the biggest tourism draws continues to be its elegant historical architecture, AKA "heritage tourism." 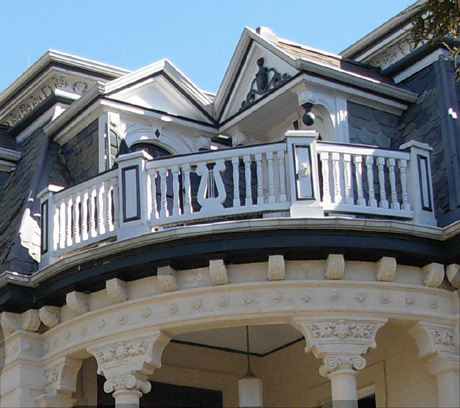 The tourism bureau claims Galveston has the largest concentration of Victorian architecture in the country and I can believe it. Too bad folks didn't restore and rebuild all those buildings seventy years earlier! 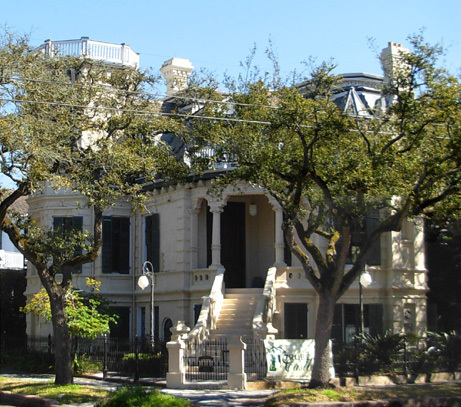 In San Antonio we were able to walk much of the historic residential district. Not so in Galveston. It is too big, especially for Jim after running Rocky Raccoon so recently. You'll understand this in a minute, when I describe the size of the three main historical areas. We did walk a couple miles but most of it we drove. 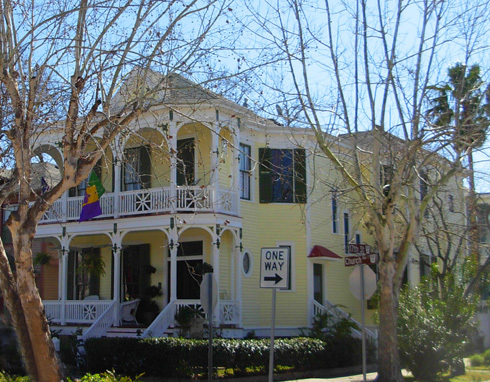 I sometimes had Jim stop so I could get out of the truck to take better pictures.. And we didn't even take the time to drive every street in all three historic districts because of the time it would have taken. That's a lot of vintage architecture! 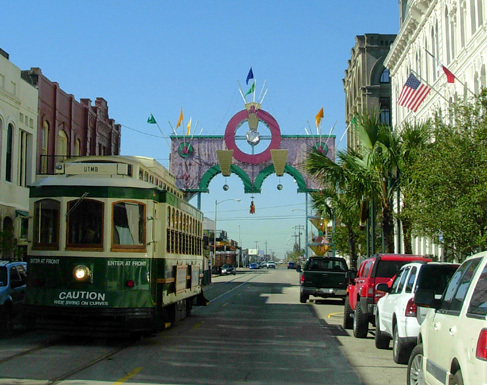 The three historical districts are known as The Strand (about 15 square blocks), East End (over 50 blocks), and Silk Stocking (about 8 blocks). 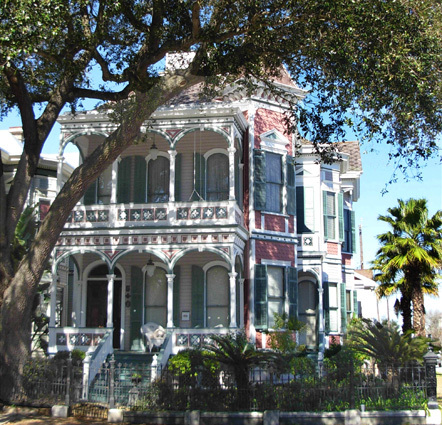 The large East End Historic District has been placed on the National Register of Historic Places and is a designated National Historic Landmark. 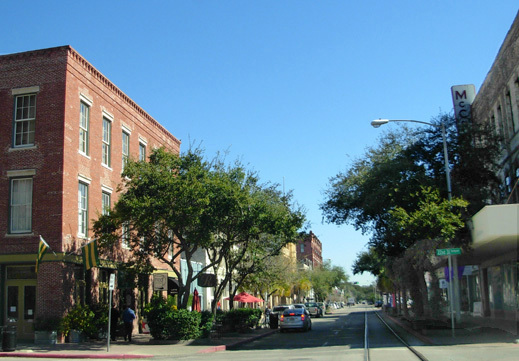 The Strand and Silk Stocking districts share the same designations, although not all the buildings in those areas are National Historic Landmarks. 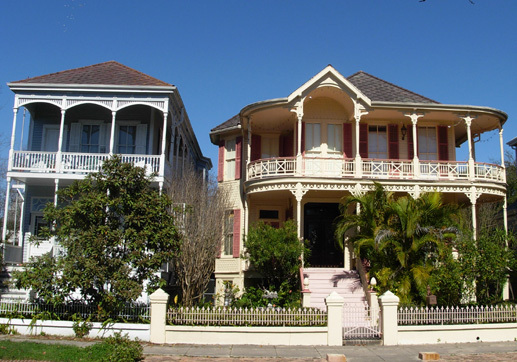 The three districts border on each other and contain a variety of architectural styles and periods beginning with Greek Revival homes and public buildings constructed during the 1850s. Homes range from small, simple cottages to large, elegant mansions. Their size and design mirror the wide cross-section of folks who settled here in the nineteenth century. 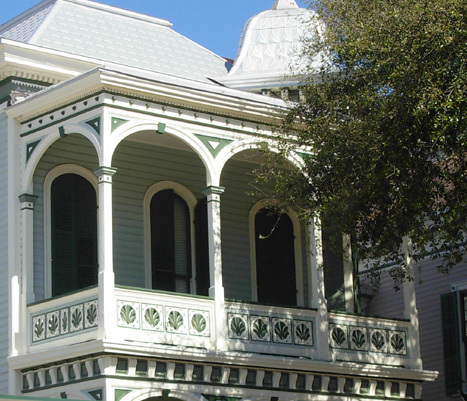 That cultural, ethnic, and economic mix is still prevalent in Galveston today, contributing to its charm. In this entry I'll focus on some of the interesting houses that caught my attention as we walked and drove through the historical districts, primarily the East End (which is mostly residential). In Part 2, I'll highlight three elegant mansions that can be toured, two outstanding church buildings, and several distinctive commercial and public buildings. I took photos of only a few of the thousands of beautiful houses and other buildings in this charming city. I didn't write down every address and in some cases I can't remember which building is in which district because they are adjacent to one another. We obtained brochures and maps from the Galveston H istorical Foundation, which is housed in the 1861 Custom House. You can also get information from the Convention and Visitors Bureau and the visitor center at Ashton Villa. 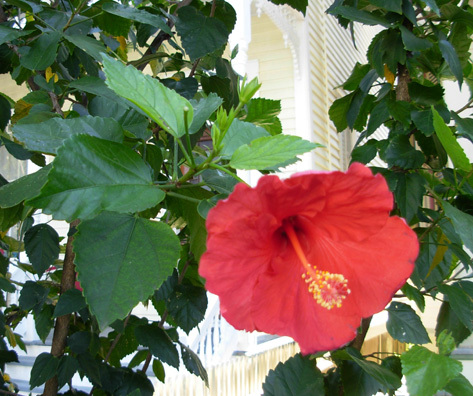 These are good places to plan any self-guided walking or driving tours in Galveston. You can also tour the districts by trolley. Here are some of the interesting houses I chose to photograph during our walking tour of the East End Historic District. I love the diversity of periods and styles! I'll provide addresses and details if I was able to find any on the internet. I realize now that I was drawn to several homes with "arcaded" porches. In architectural terms, an "arcade" is a series of arches that are supported by columns, piers, or posts, as you can see in the first set of photos. These represent quintessential "Victorian" to me. Arcaded Queen Anne style c. 1887 at 1808 Postoffice Street (above). 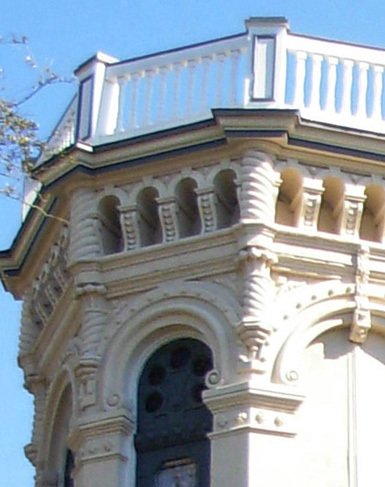 Porch detail, below. 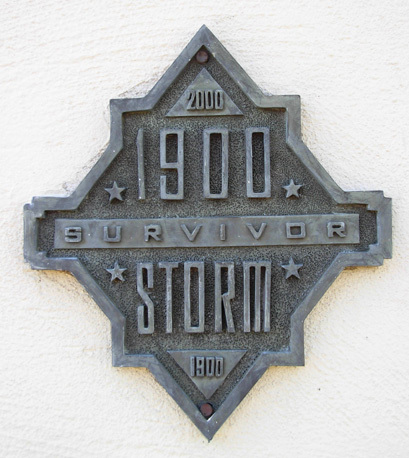 These "badges of honor" were produced in 2000, a century after the Great Storm. The next two houses qualify as "mini-mansions." You'll understand why I call them that after seeing three larger mansions in the next entry. 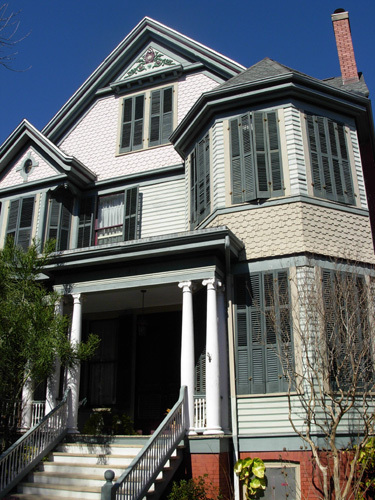 Both are listed in the National Register of Historic Places and are Recorded Texas Landmarks. Confederate veteran and capitalist Henry Landes had this house built in 1887-8. It was designed by two prominent architects, George A. Dickey and D.A. Helmich. 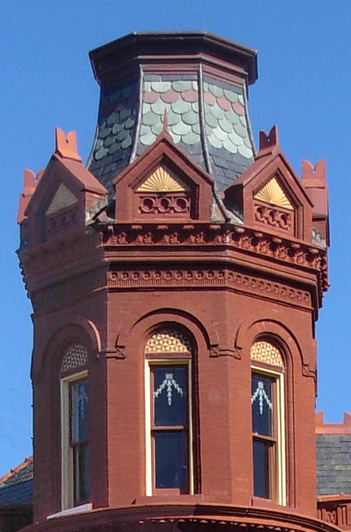 It features fine ornamental brick and terra cotta, elaborate ironwork on the verandas, parapets (low protective walls) along the edges of the roof, an "exuberant" tower, arched windows with fancy tile and molded trim, and colorful shutters. 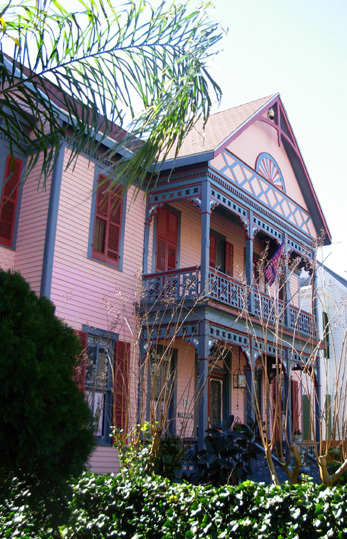 This house is not only a survivor of the disastrous 1900 hurricane, it also reportedly provided refuge for about two hundred storm victims! 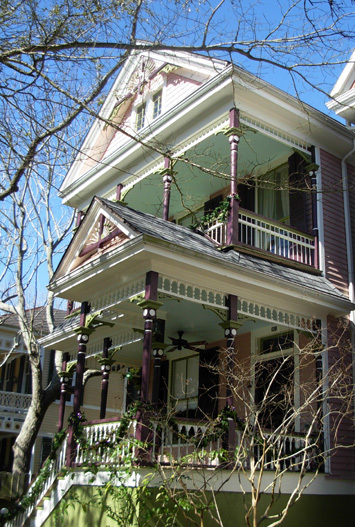 John P. McDonough, owner of a dry docks and ironworks business, purchased the house in 1911. After it was acquired by the Dominican Sisters in 1954 it housed a fine arts center for a number of years. 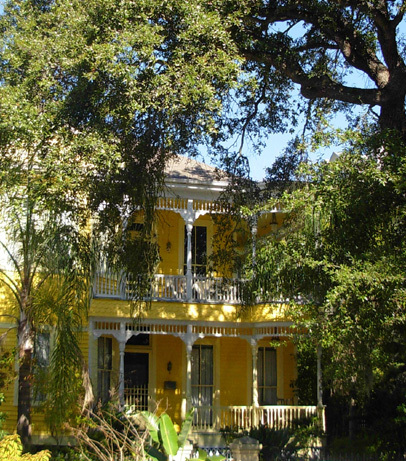 Several people have owned the house since 1970 and have done some restoration inside and out. There is an interesting article in the Islander Magazine about the entire history of the house and the concerted efforts to restore it to its original glory by the current owners, Marylee and Edward Kott. Some old drawings and photos are included in that article. 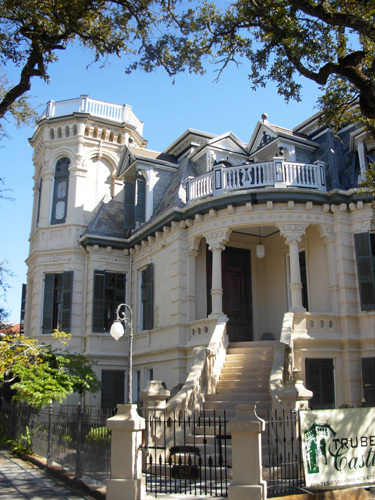 This three-story Danish castle-inspired house designed by architect Alfred Muller was built in 1890 for John Clement Trube, who was born in Denmark and became a successful Galveston businessman. Built of solid brick with a stucco-Belgian cement finish, it is sturdy -- it has withstood all the hurricanes and storms the Gulf has thrown its way. 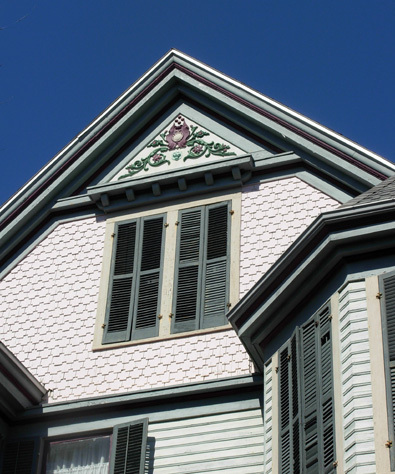 According to the castle's web site: "The mansard slate roof with seven gables and the battlement tower give the historic home a castle distinction. The observation deck on the top of the tower offers a view of both the gulf and the harbor." The house was situated on the diagonal at Sealy and 17th streets for the views, Gulf breezes, and privacy in the bedrooms. Trube and his wife, Veronica Durst, had nine children. The home remained in family hands until recently. Still privately owned, it is currently available for corporate events, parties, and other celebrations like weddings and receptions. It is open for tours with reservations. Apparently it's also for sale, per this You Tube video link on the home page. I haven't researched the asking price. 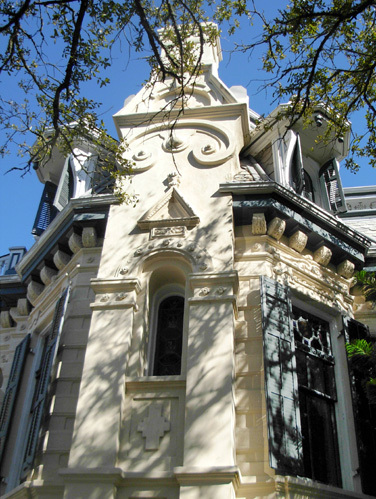 Just think -- a Danish-inspired castle could be YOURS in Galveston!! 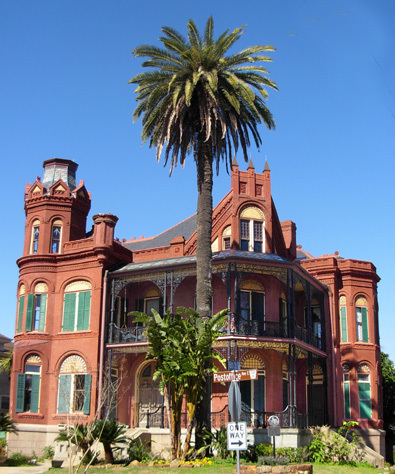 Next entry: Part 2 of Galveston's eclectic architecture -- three even larger mansions, two impressive churches, and four distinctive commercial and public buildings that are nationally-recognized historic places.